Placerville is a charming California “gold rush” town named after the placer gold deposits found in its’ river beds and hills in the late 1840’s. 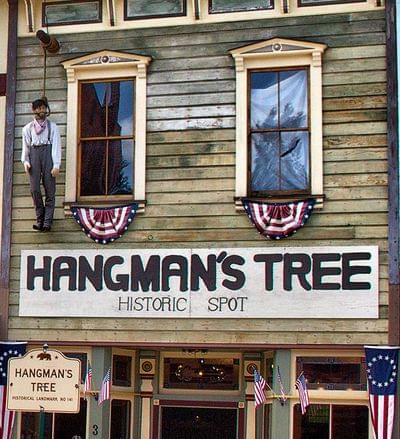 During the gold rush, Placerville was the seat of law and order where criminals met with swift justice often at the end of a rope, hence the early name of Hangtown. Today, the City of Placerville is centrally located between California’s Capitol of Sacramento and South Lake Tahoe in beautiful El Dorado County, a world class outdoor recreation area. Some of the things you will want to be sure to enjoy while visiting Placerville and the surrounding area are the many premier wineries, Apple Hill Ranches, Historic Coloma, the American River, and the El Dorado National Forest. There are links to information about these activities. Situated above the fog line and below the snow line, Placerville boasts an ideal climate with four distinct seasons. Accessibility to Placerville is via State Highway 49 and U.S. Highway 50, along one of the most traveled corridors in California. Placerville’s treasured heritage is reflected in the historical, nineteenth-century architecture of its downtown core. In addition, Placerville is the County seat and the center of financial, commercial, civic, and Government activity. These groups are working together on business improvement and revitalization projects to preserve, promote, and enhance the quality of life for all in the community. A big part of Placerville’s revitalization process has been the creation of downtown festivals and special events. These festivals celebrate local history, agriculture, music, food and culture and reflect a desire for citizens to take pride in their community. The Placerville Downtown Association, a nonprofit merchants’ organization, has taken on the task of hosting and promoting these events as a way to enhance visits to Historic Main Street. Some of the more popular events have been the Art & Wine Festival, Bell Tower Brewfest, Craft and Antique Fairs, Classic Car Shows and the Festival of Lights that signals the start of the busy holiday season. The history of Placerville began with the “rush for gold” to California in the 1840’s. The highly publicized discovery of gold in the tailrace section at Sutter’s Mill in Coloma (only 10 miles from Placerville) in 1848 resulted in the migration of thousands of fortune-seekers to Northern California in the mid 1800’s. The town of Placerville was named after the placer deposits found in the river bed between Spanish Ravine and the town plaza. During the gold rush, Placerville became an important supply center for the surrounding mining camps. Placerville was also known as “Hangtown” in its’ early days. Although many stories exist on how this name was acquired, the most famous story involved a colorful event that occurred in January of 1849. A gambler named Lopez gained a lot of attention for his big winnings at a local saloon. After he retired for the evening, several men tried to overpower him. Lopez fought back, and with the help of others, the robbers were captured. During their “flogging”, three of the robbers were also accused of being wanted for a murder and robbery. With no more evidence than that, a short 30 minute trial took place and a unanimous “guilty” verdict was given. The crowd demanded that the men be sentenced to “death by hanging” and the rest was history. The famous hanging tree once stood in Elstner’s Hay Yard, next to the Jackass Inn. Today, the original stump from the old tree remains in the cellar of “The Hangman’s Tree” tavern on Historic Main Street. Throughout history, several famous entrepreneurs have conducted business on Main Street. Mark Hopkins (railroad financier), John Studebaker (auto maker), and Snowshoe Thompson (mail-carrier through the Sierras) were among the well-known shopkeepers on Main Street. An important historic landmark that still remains on Main Street is the Bell Tower, standing as a monument to the city’s volunteer firemen. The Bell, placed in the tower in the plaza in 1865, was used as an alarm system to call out the firefighters. 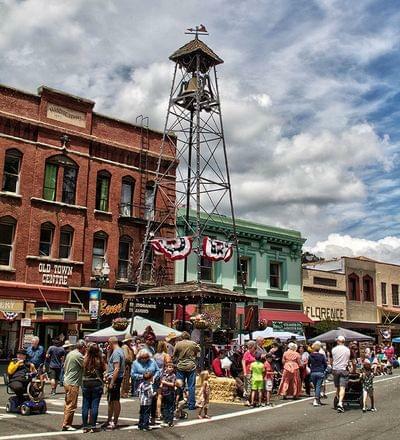 This tower has watched most of Placerville’s history pass beneath it for well over 100 years. It has been remodeled, relocated, and most recently, renovated. Today it proudly stands as a monument to honor our city’s volunteer firemen. The history of the Bell Tower began back in l856. Three fires that year in April, July and August, claimed most of Placerville’s business section. The need for an alarm system to call the volunteer fire department was obvious, and a bell was ordered from England. Cast in 1860, the bell arrived in Placerville in 1865. The city gave it’s approval to place the bell in a tower in the plaza. All this was done at a cost of $380.00. 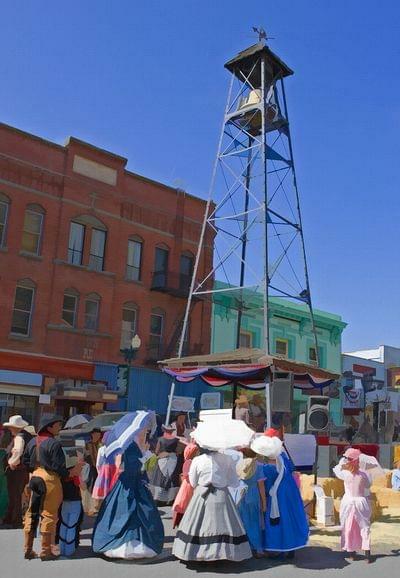 Today, the Bell Tower serves as a gathering place for parades, celebrations, and other Historic Main Street events. Location, climate, a rich heritage, and a high level of commitment and pride have allowed Placerville to emerge as the destination in El Dorado County. To get there, exit south of scenic Highway 50 at Spring Street/Highway 49 and veer left. Public parking, in addition to a limited amount of RV parking, is available in the many lots or at the Center Street Garage.